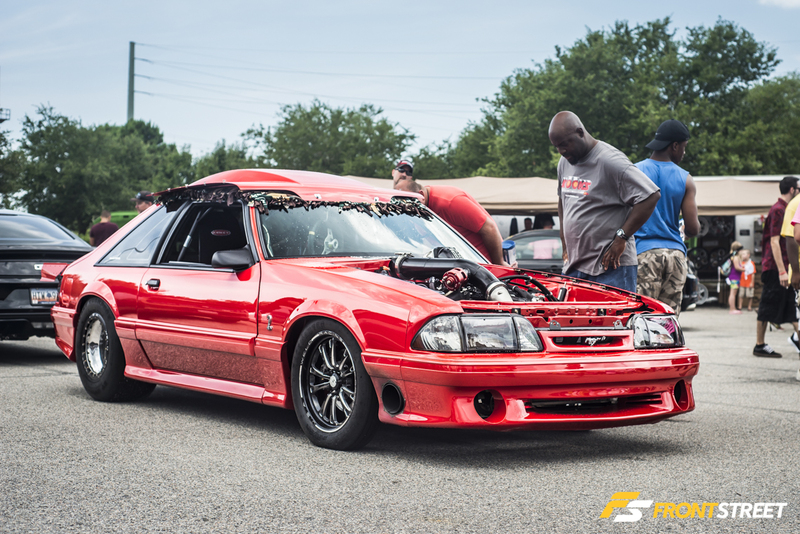 Hopefully everyone caught our Mustang Week – Part 1 coverage, where we covered some small meets and the dyno day. 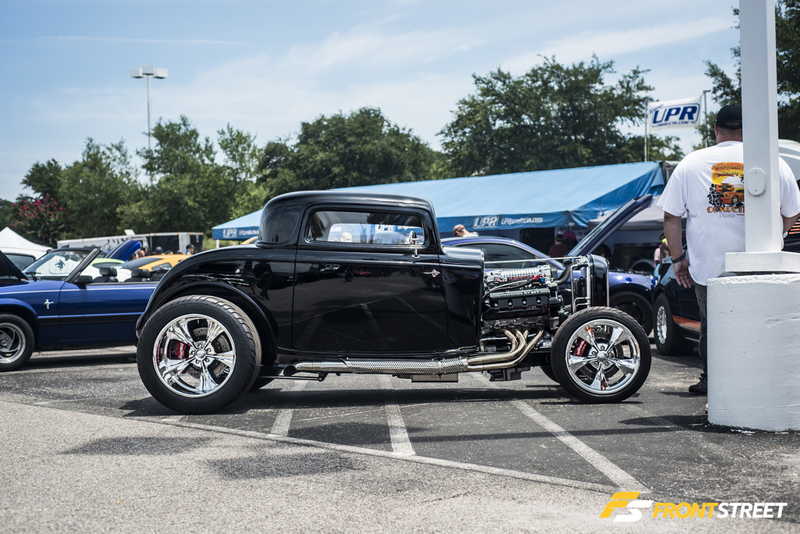 Our Part 2 coverage begins with the “Cruise In”. 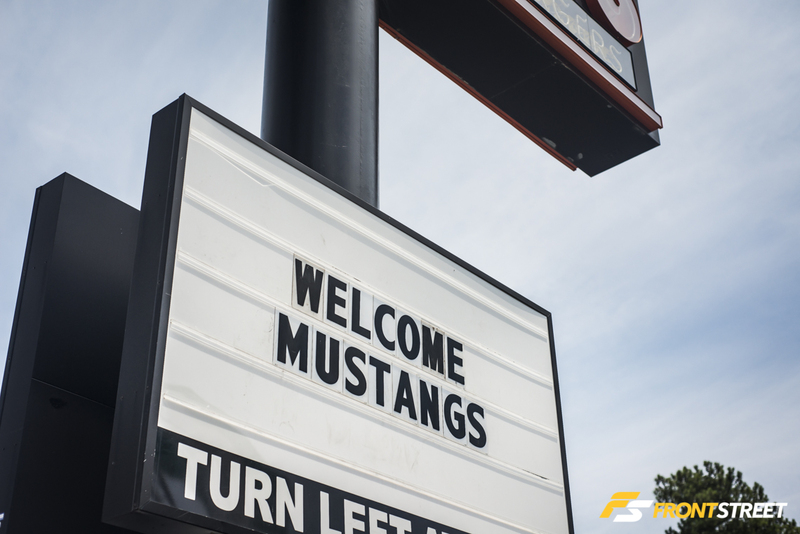 The “Cruise In” is held on the last day of this weeklong celebration of the Mustang. 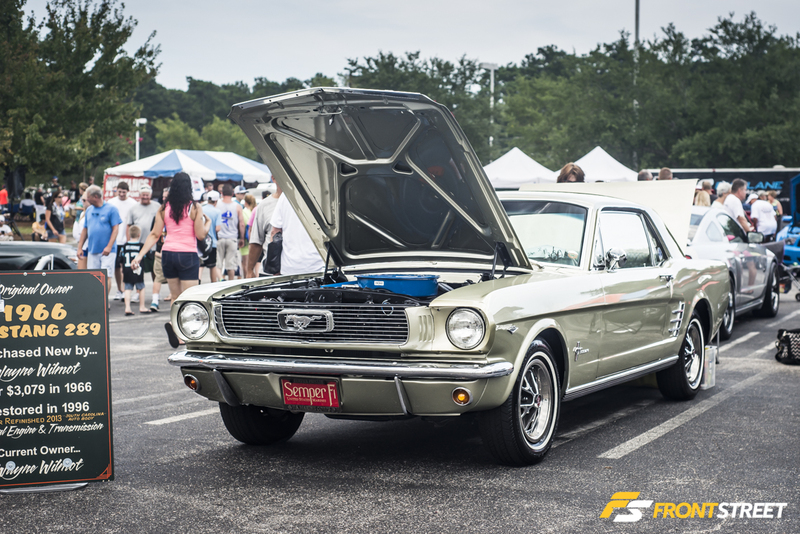 The previous day’s event was based around a registration process that only permitted 500 cars in the show parking. 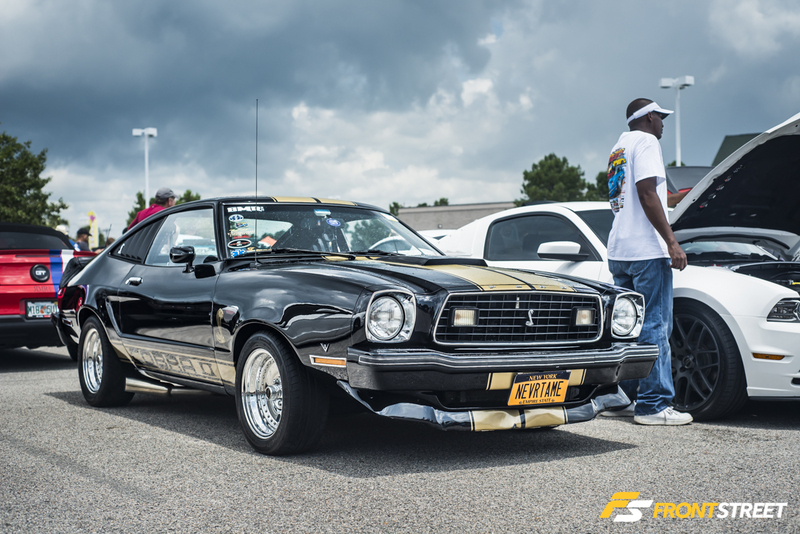 The cruise-in day gave no special treatment, and hosted any car that could find a spot to park. 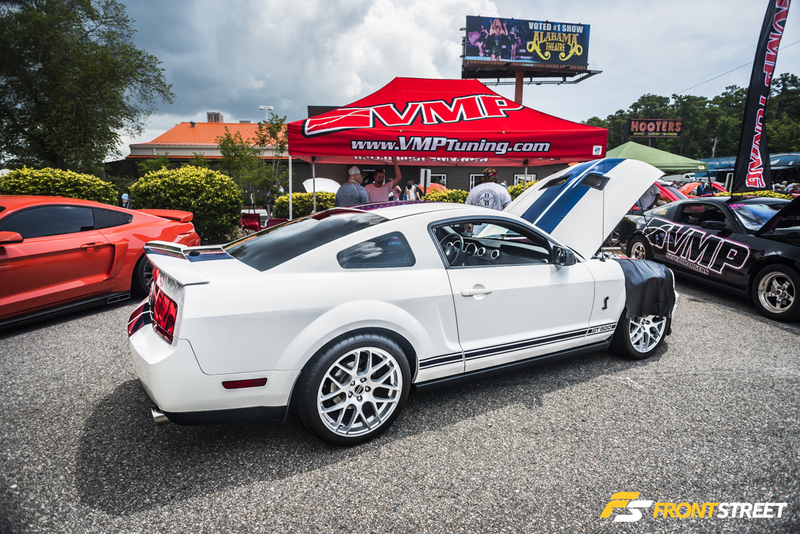 This spotless example of an SVT Cobra parked in the main vendor area had a set of True Forged wheels. 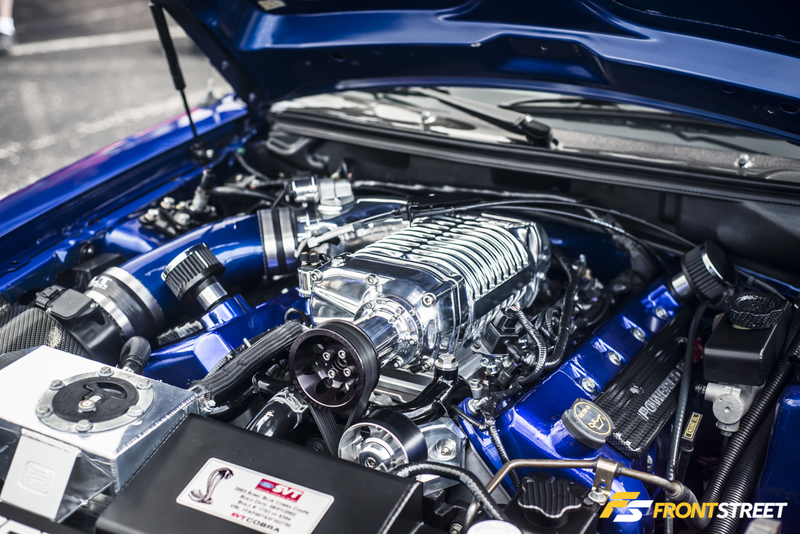 In the engine bay, there were subtle carbon fiber accents visible at every corner. 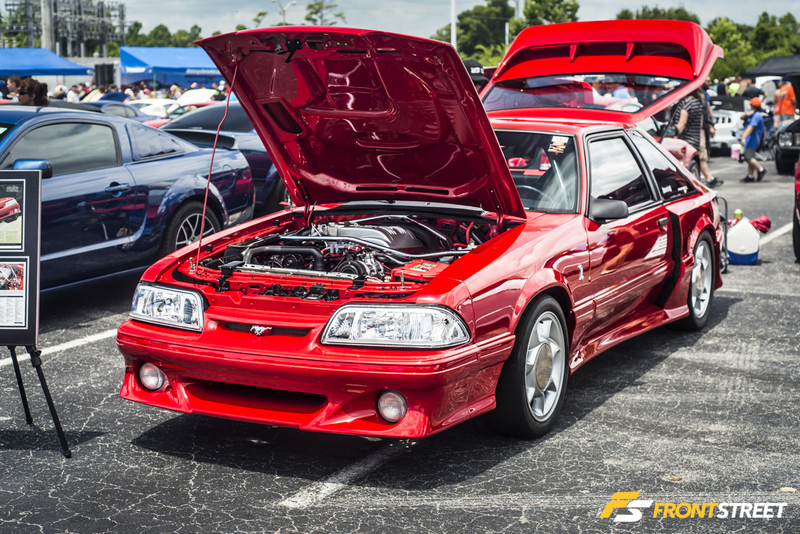 It was interesting to the see the varying companies that rebranded the Mustang chassis in the early 90’s. 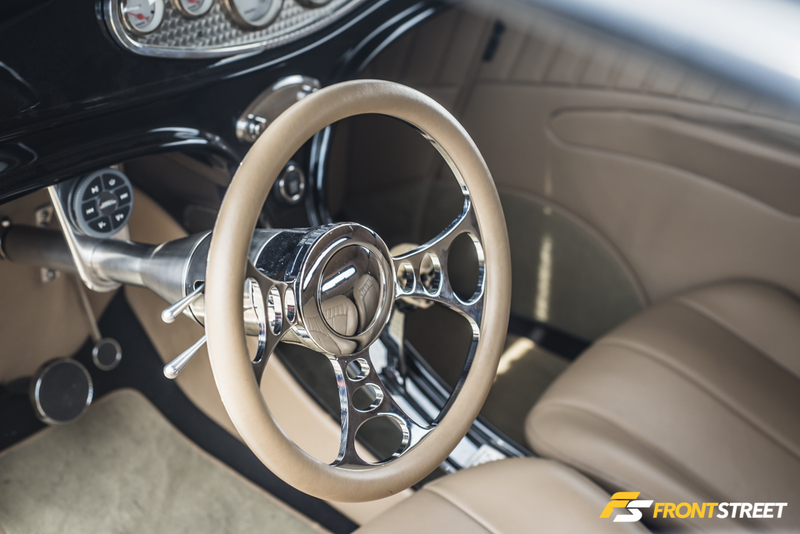 This well cared for ASC McLaren was a surprising guest. 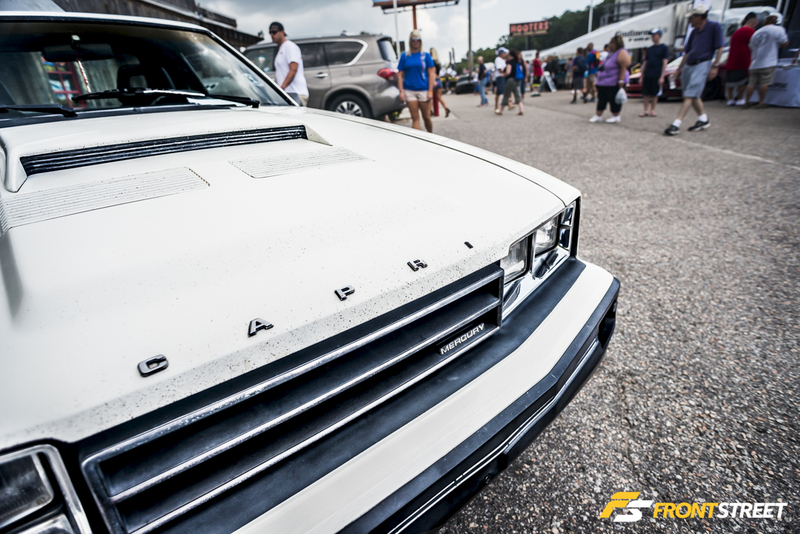 The Mercury Capri was also produced on a Mustang body in the early 90’s. 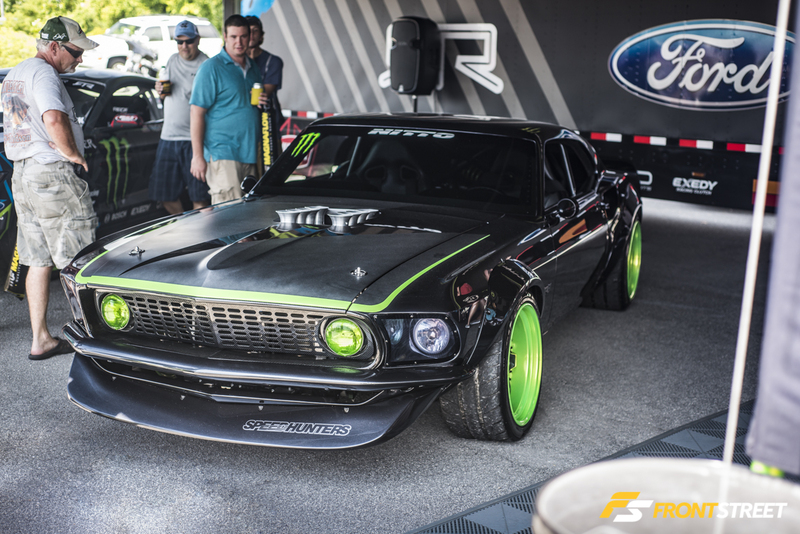 The alternate front end designed on these cars is much more reserved than the aggressive lines of its Ford counterpart. 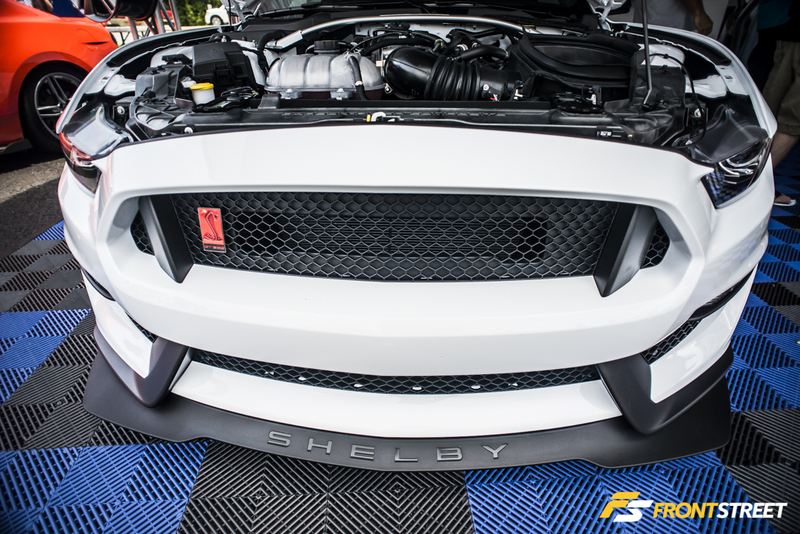 At the VMP Tuning booth, there was a supercharger being installed on this Shelby GT500 throughout the day. 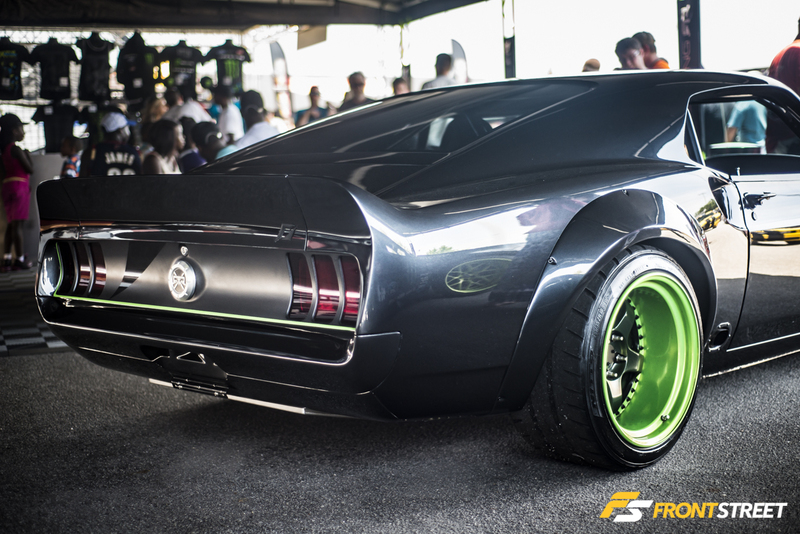 This female owned highlighter yellow wrapped Coyote brought a lot of attention. 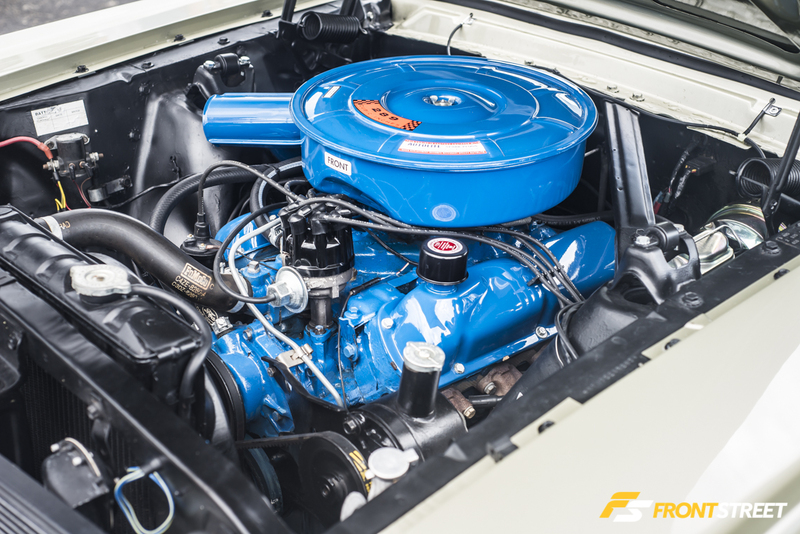 A glimpse into the engine bay revealed a Vortech blown engine and the original “Gotta Have it Green” paint scheme. 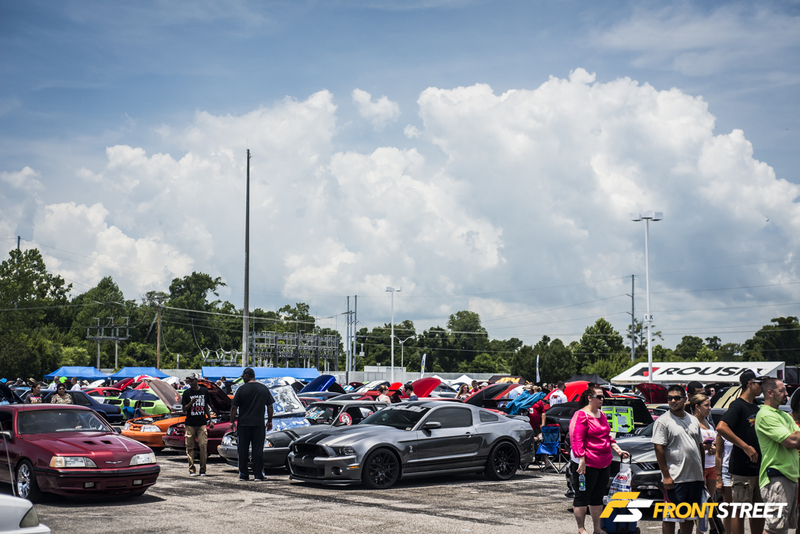 Rainclouds loomed overhead all morning, and eventually brought a shower early in the afternoon. 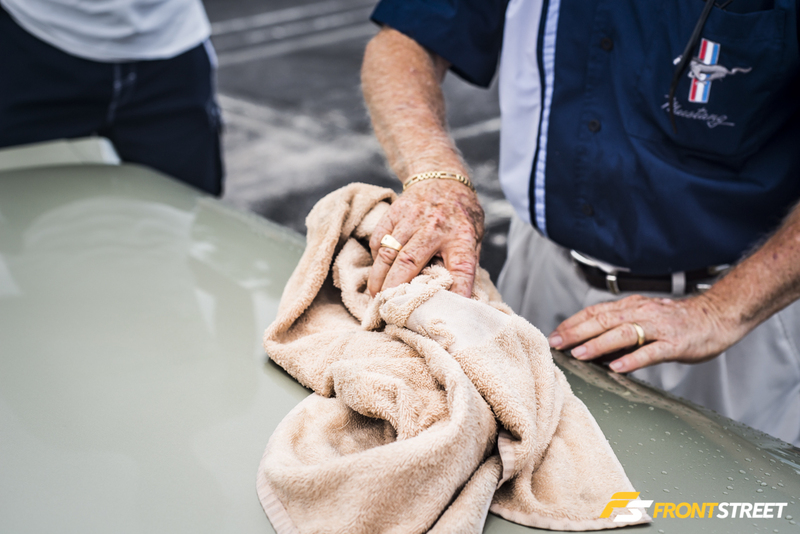 There was a rush from owners trying to get back to their cars, to prevent dreaded water spots, or to close their convertible tops. 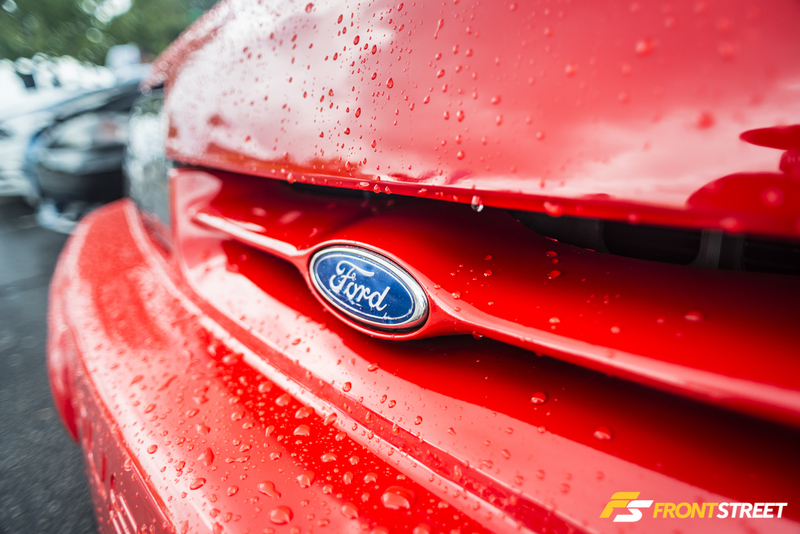 The rain came down just long enough to soak all of the cars, and then was gone as fast as it came. 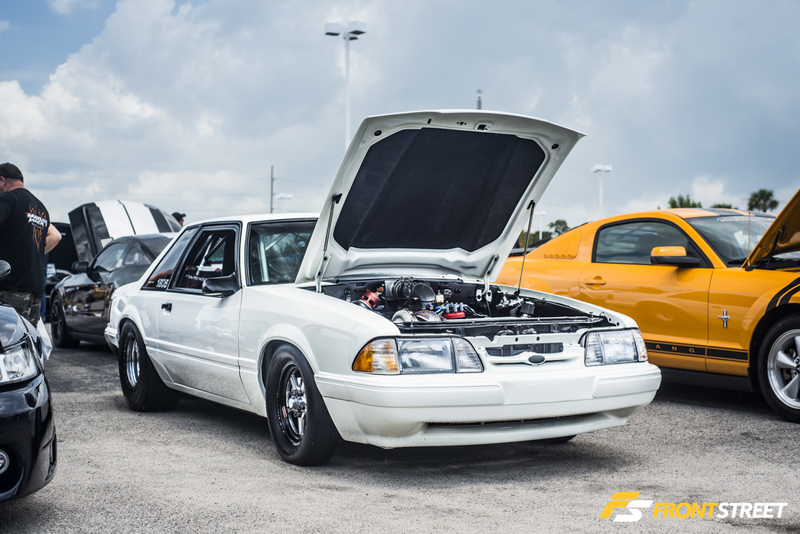 This Saleen Mustang was in such nice condition, I’m not sure it ever saw rain before that day. 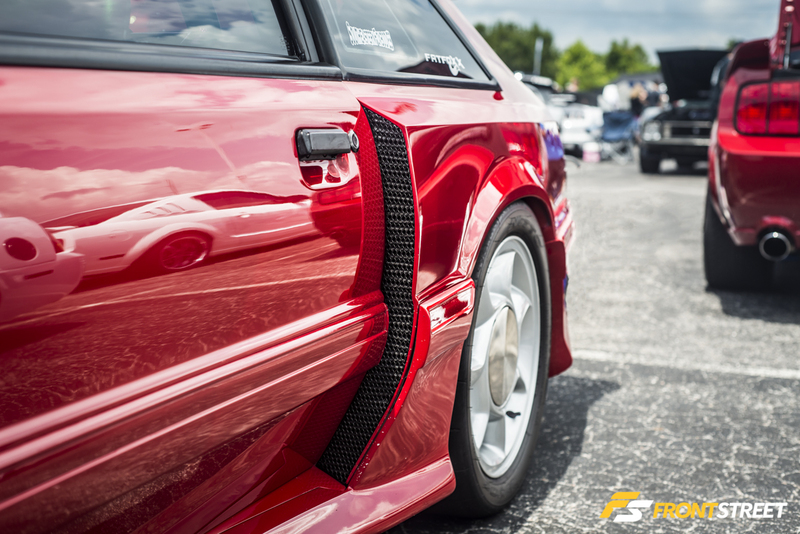 This notchback was a favorite among all attendees. 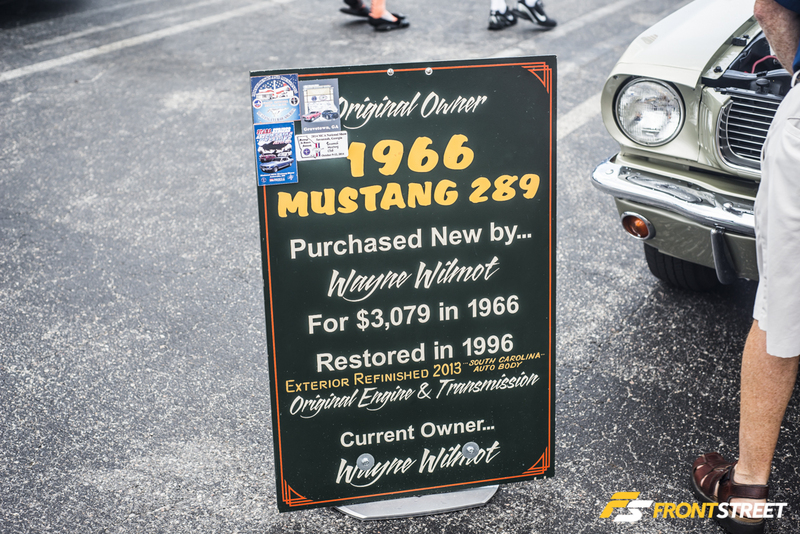 It was purchased new by its current owner in 1966 and restored 30 years later. 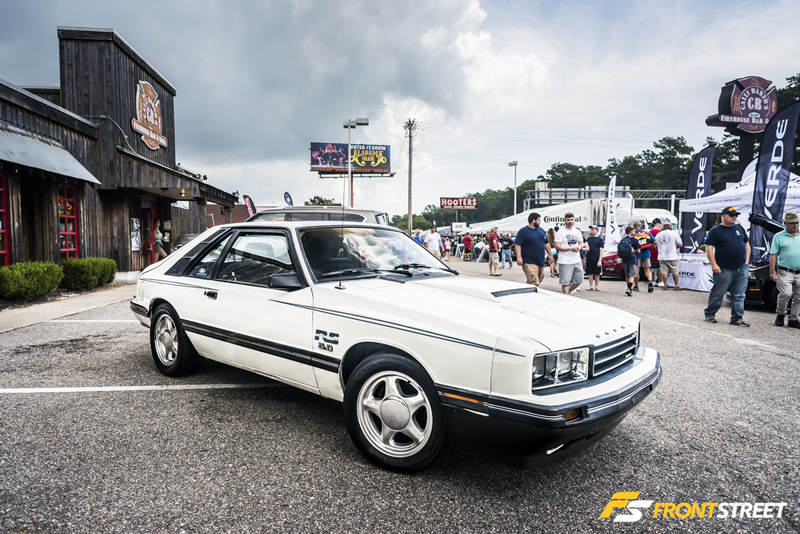 The Southeast Fox Body cruise brought a large amount of quality cars spread over several rows in the lot. 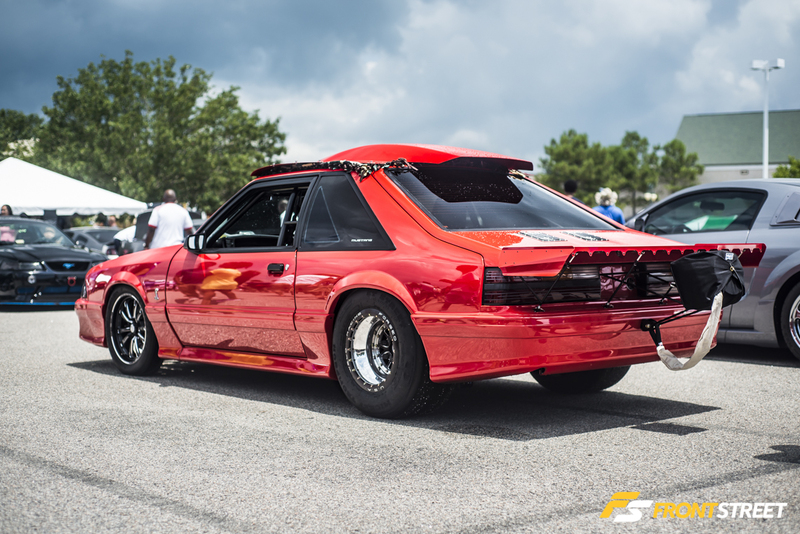 Previously featured in 5.0 Mustangs & Super Fords magazine, this widebody Fox displayed a unique modification of the rear quarter panels. 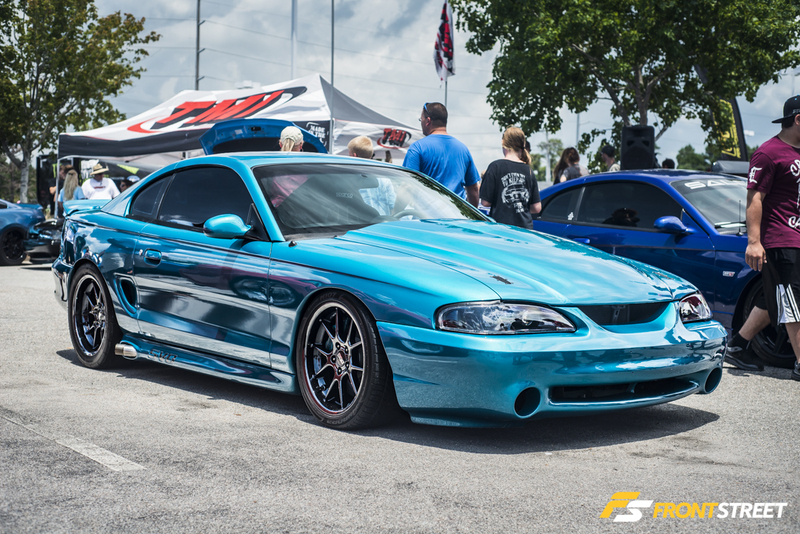 This turbocharged coupe was a great example of how to combine great looks with straight-line performance. 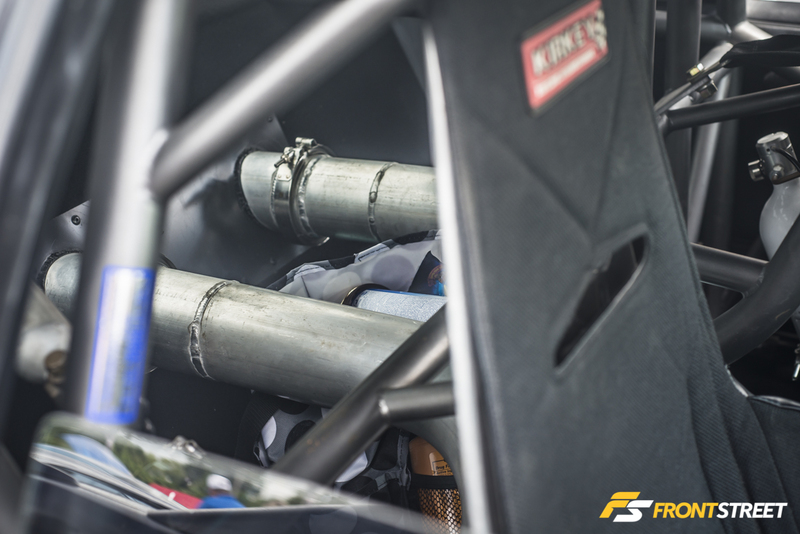 The charge pipes running through the interior suggest a large liquid to air trunk mounted intercooler. 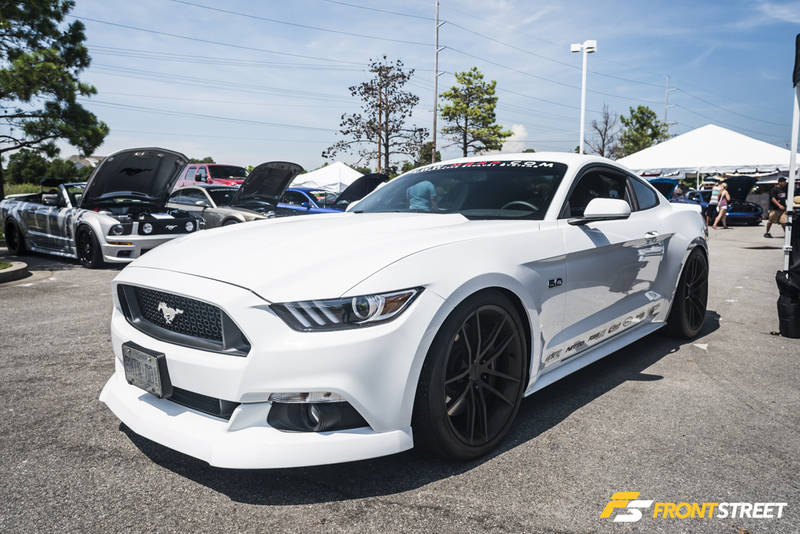 This flawless Precision turbocharged fastback was said to have laid down an 8-second pass at the drag racing event earlier in the week. 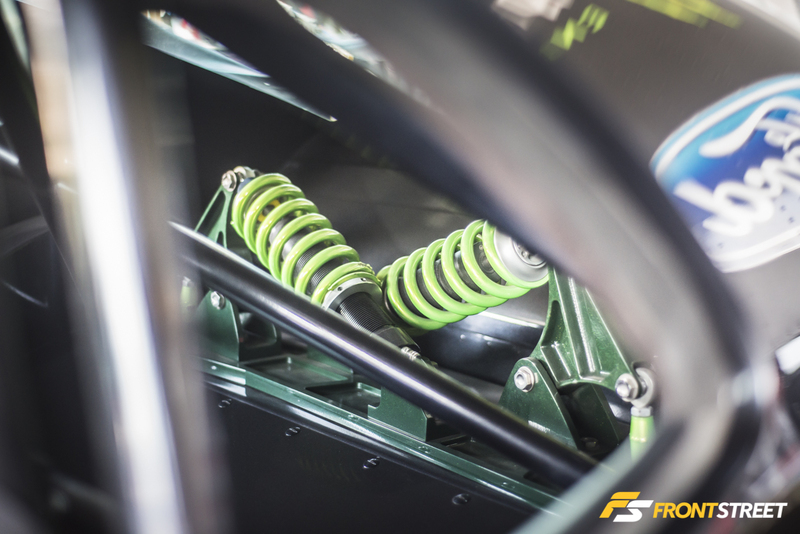 Every piece of this chassis has been converted to improve safety and race times. 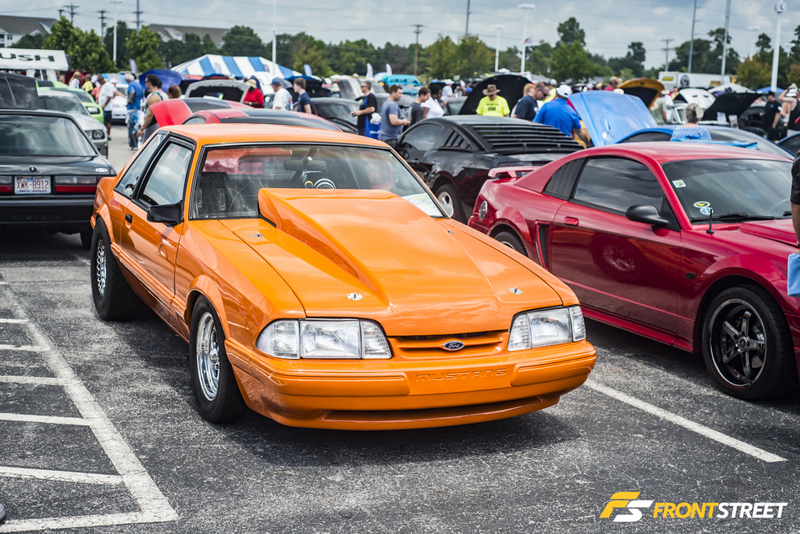 Judging by the large cowl induction hood and Mickey Thompson drag radials, this bright orange coupe was making large horsepower numbers. 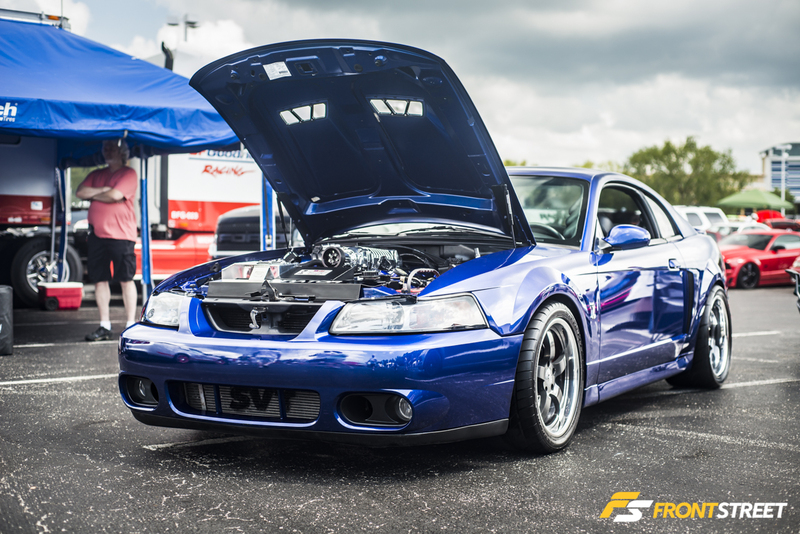 The Cobra II was offered as an optional exterior package including front and rear spoilers and a faux hood scoop. 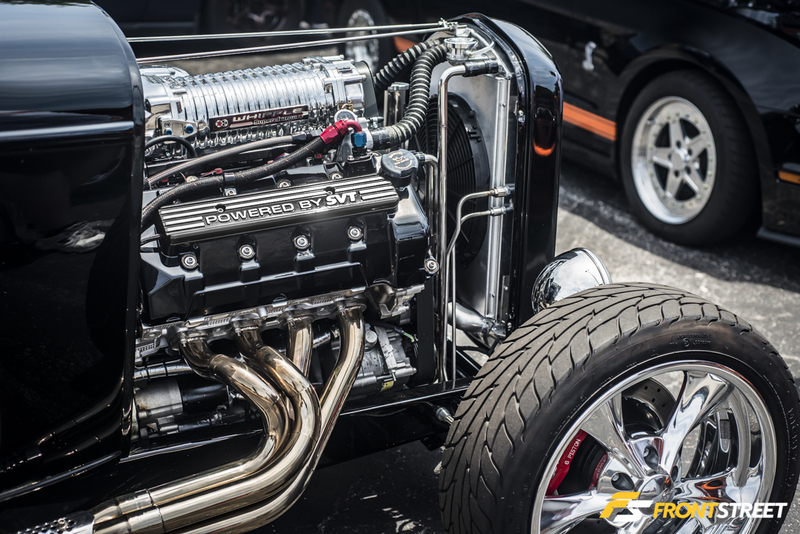 It didn’t have high production numbers so to see one in person, let alone a V8 model, was a treat for anyone walking the show. 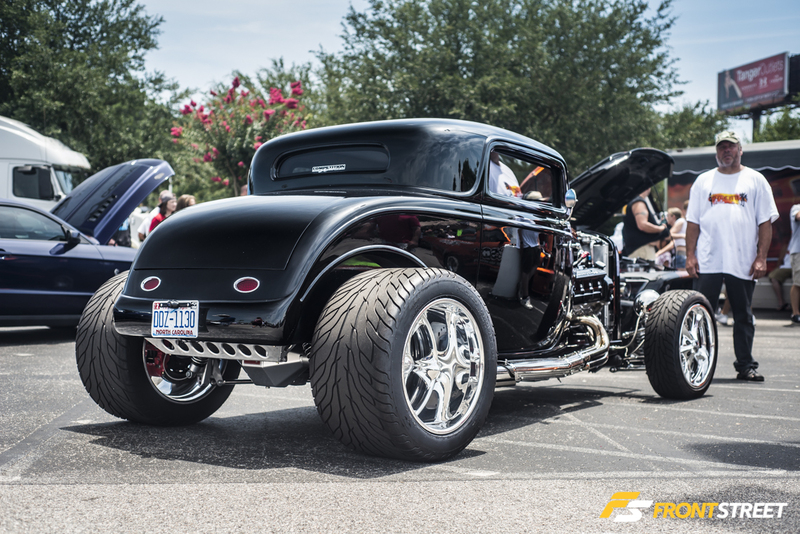 After the brief rain, this car sat for the rest of the day with its cover on. 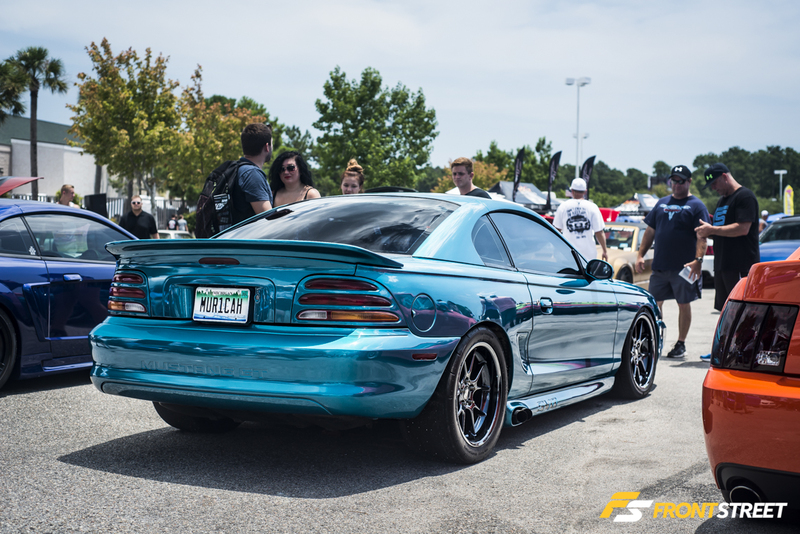 This teal GT from Michigan showcased how the aggressive SN95 Cobra exterior pieces could change the look of a car. 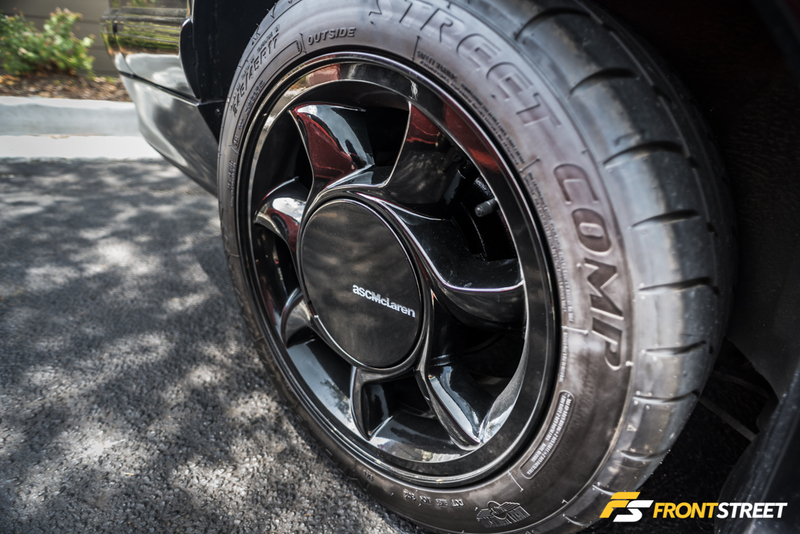 The coveted BBS RK Plasma wheels wrapped in 305/35/18 Mickey Thompson ET Streets complemented the aggressive bodylines. 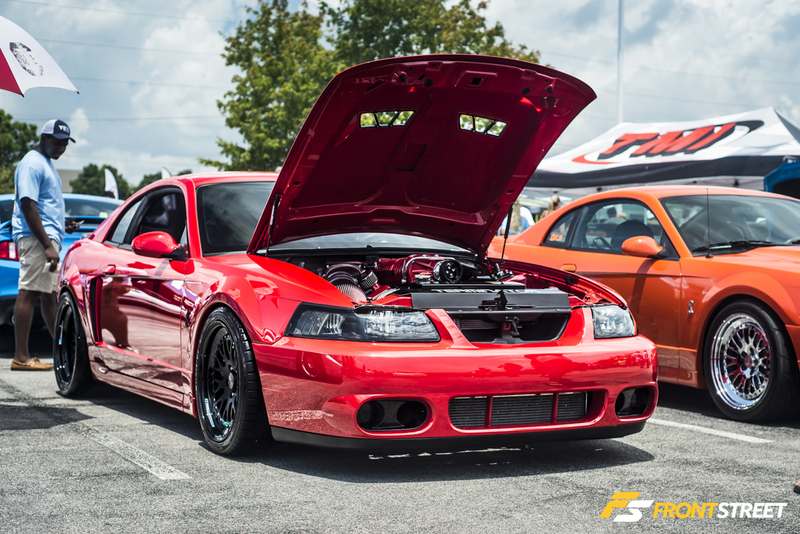 This “Terminator” carried the glossy red paint from the exterior onto the roots blower for one of the cleanest engine bays of the event. 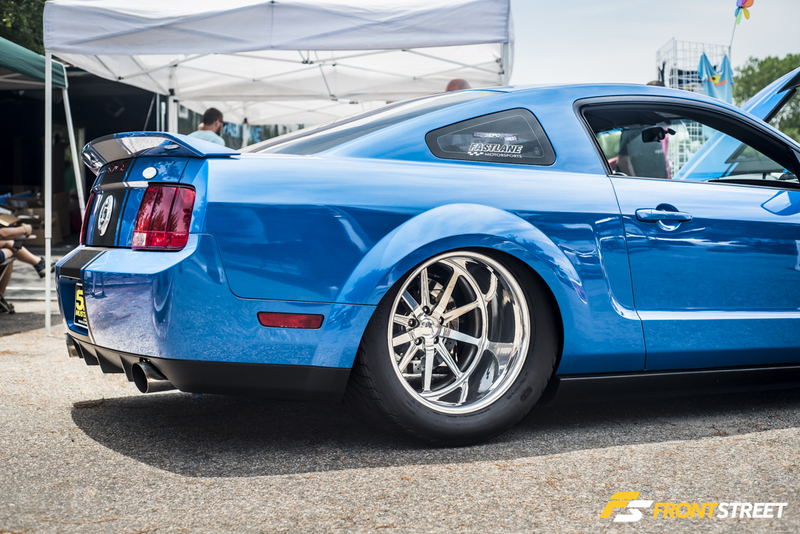 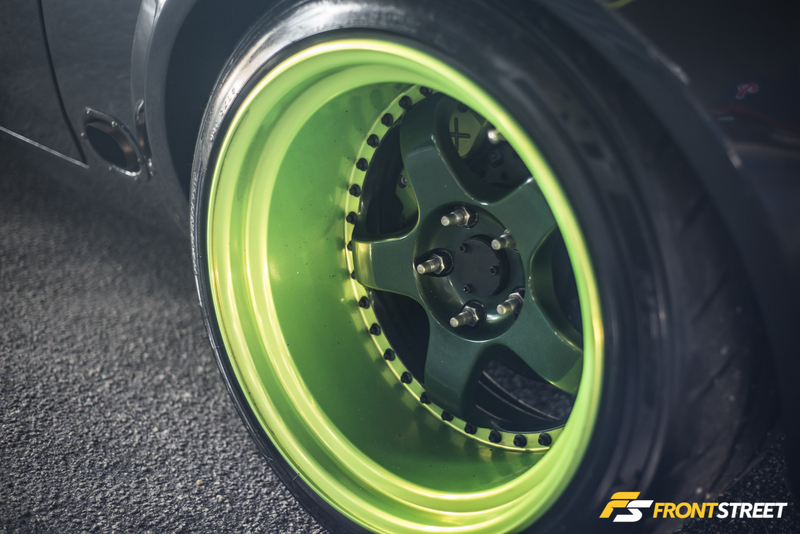 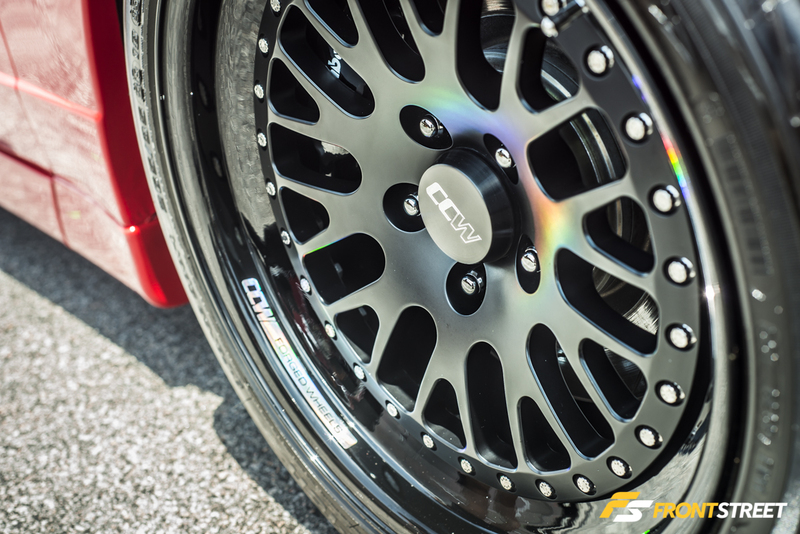 The contrast of the special edition CCW Classic wheels was the perfect selection for the otherwise bright exterior. 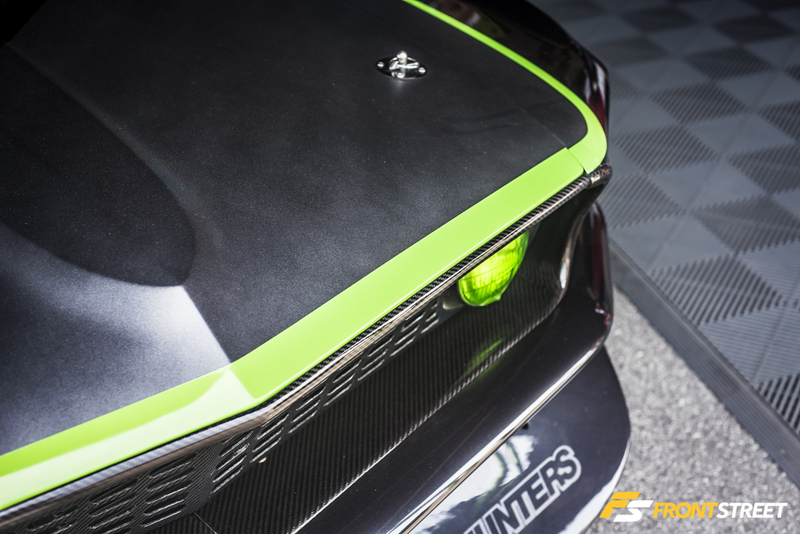 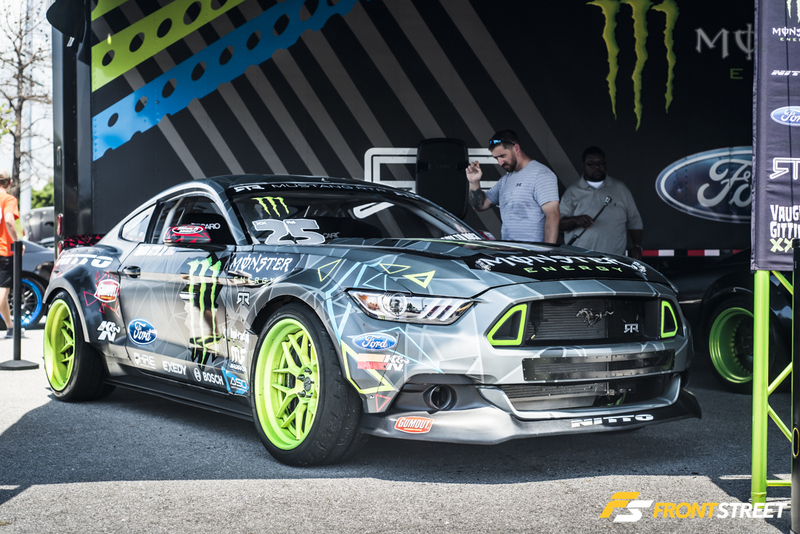 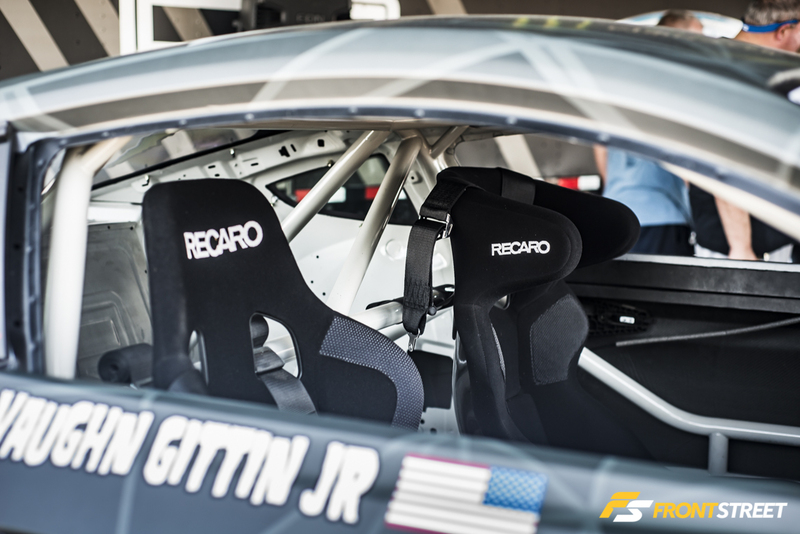 Professional Formula Drift driver Vaughn Gittin Jr. brought a couple toys with him to display at the event including the notorious RTR-X fastback. 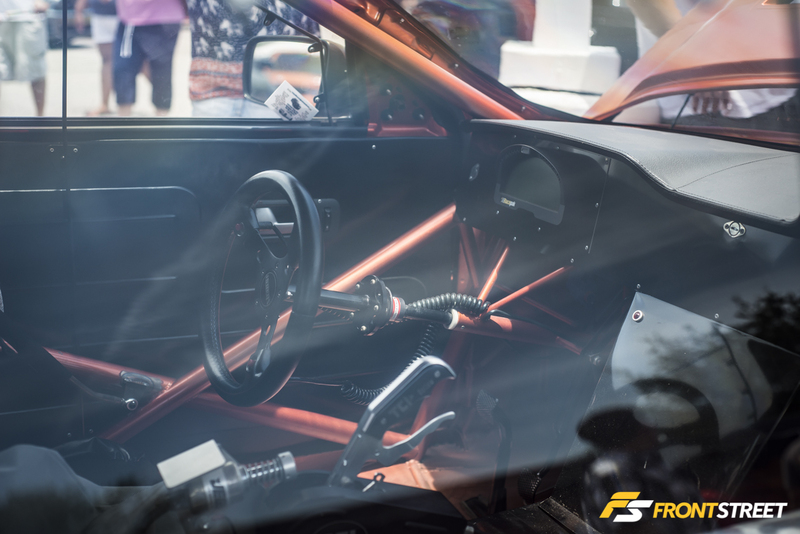 This car is full of modern innovations like the Motec SDL digital cluster inside and a cantilever suspension setup. 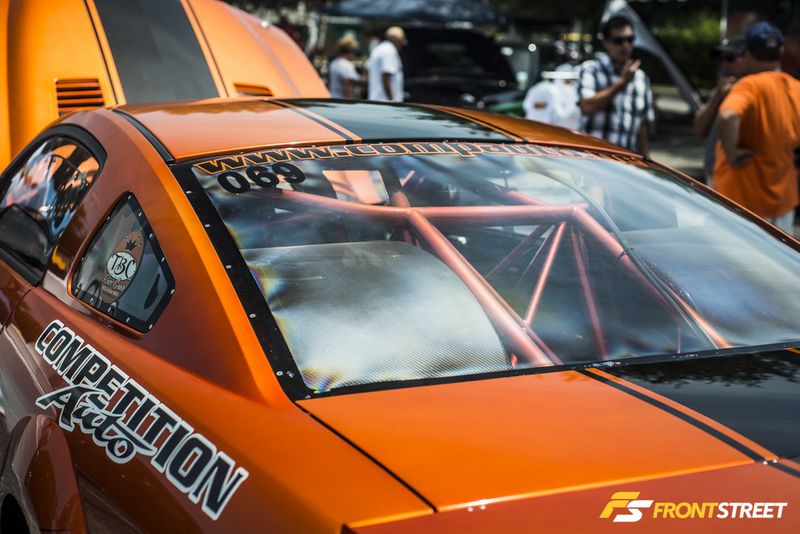 Vaughn’s RTR competition Formula Drift car was also on display with many features that transform it into a unique drift car. 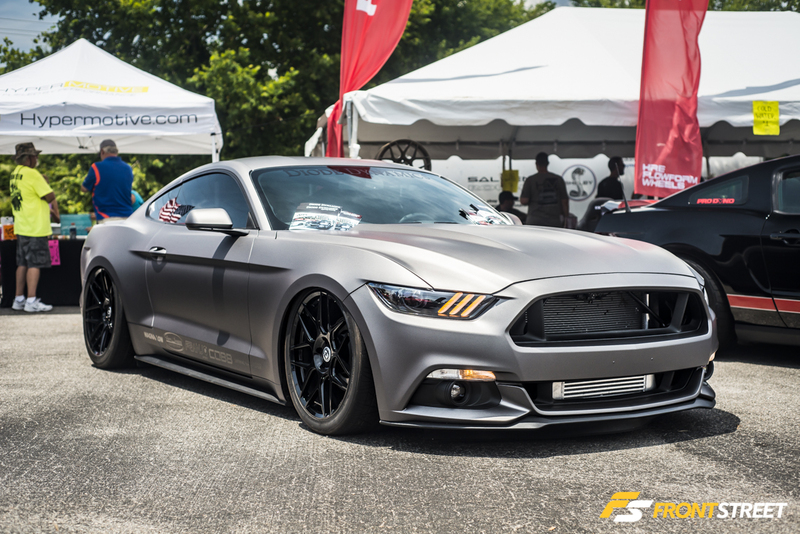 This satin grey vinyl wrapped late model had LED headlight and taillight displays from Diode Dynamics. 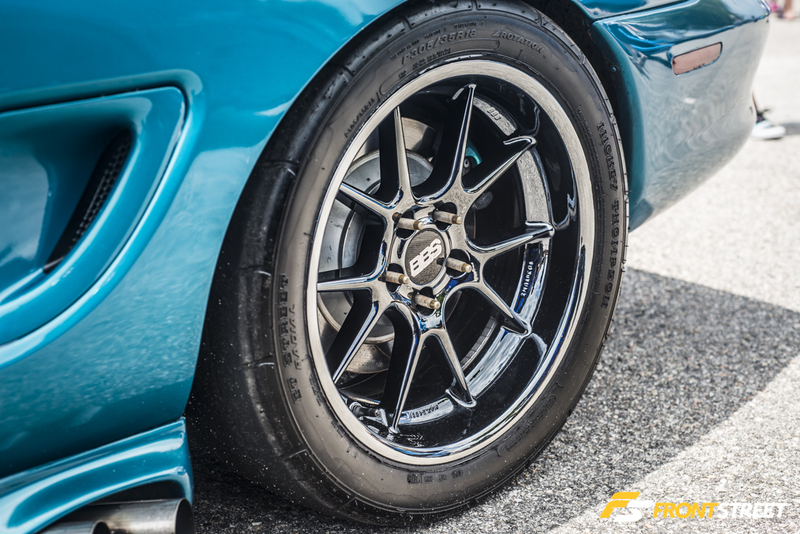 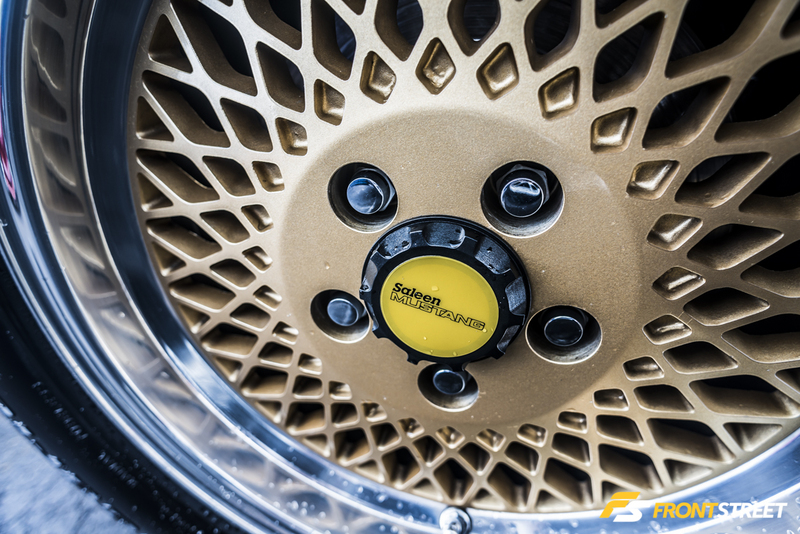 The airbag suspension planted the body directly over the HRE wheels. 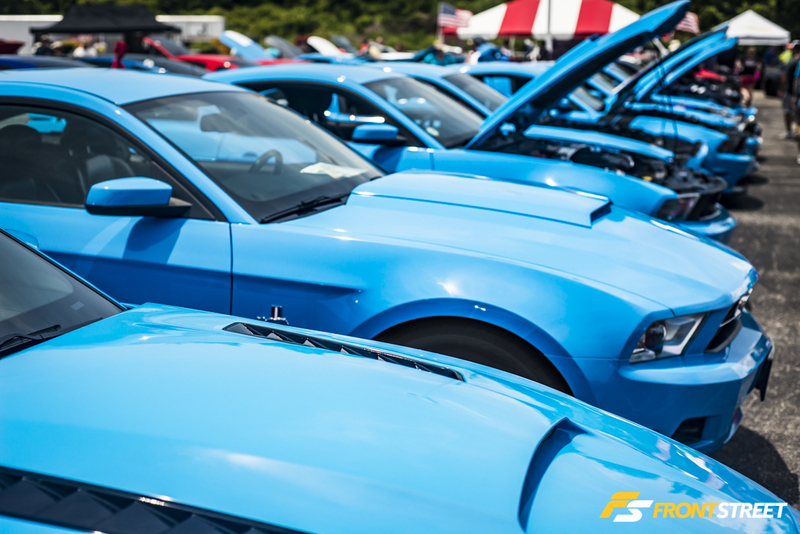 There was a small string of color in one of the lots, as a group of Grabber Blue Coyote owners parked their cars together. 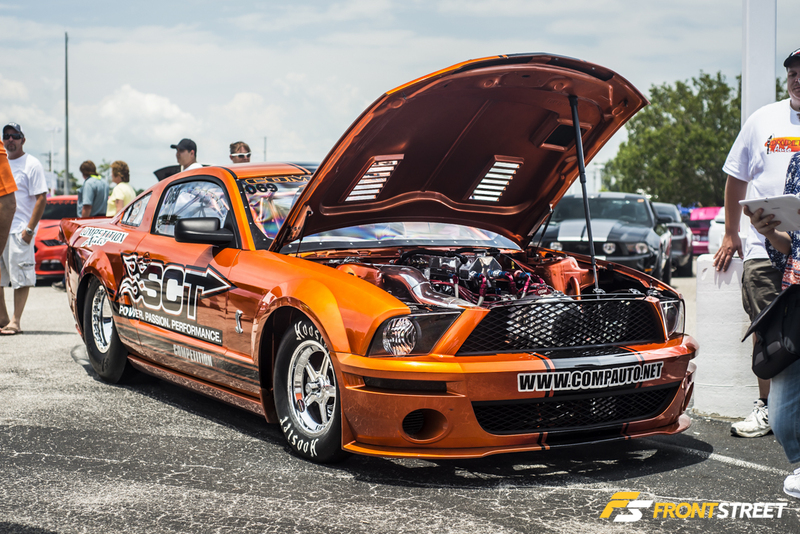 Competition Auto brought a couple different projects including the world’s fastest single turbo GT500 drag car. 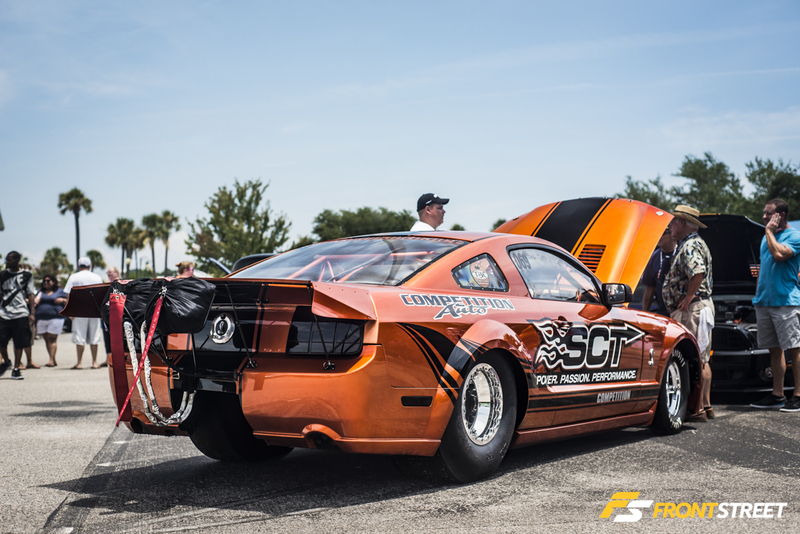 One of them was this 7 second SCT sponsored drag car. 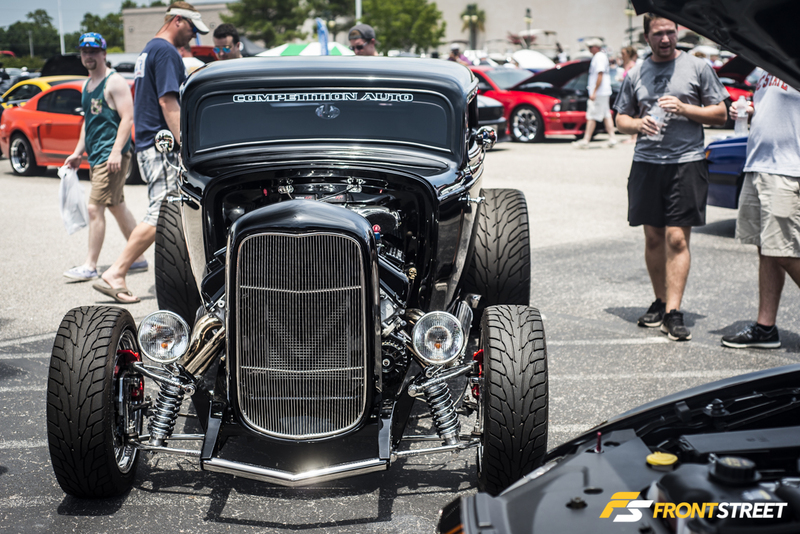 Their other display vehicle was this 30’s Model A with a Whipple Supercharged 4V swap. 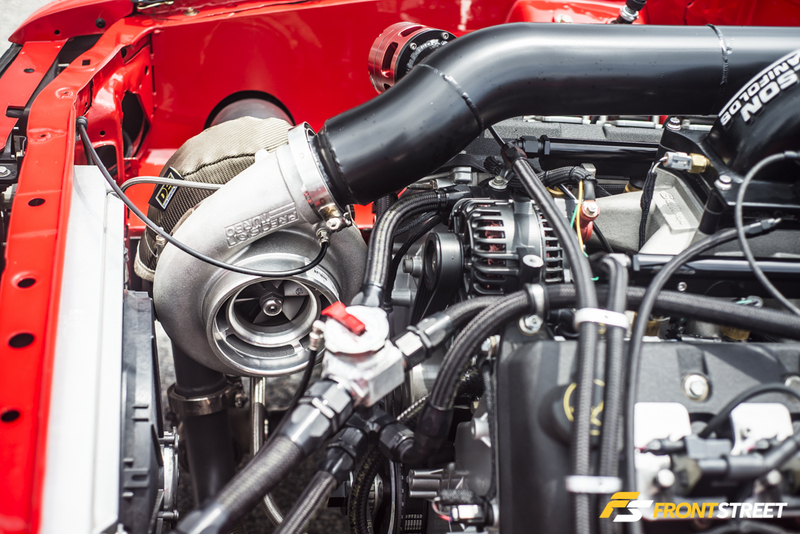 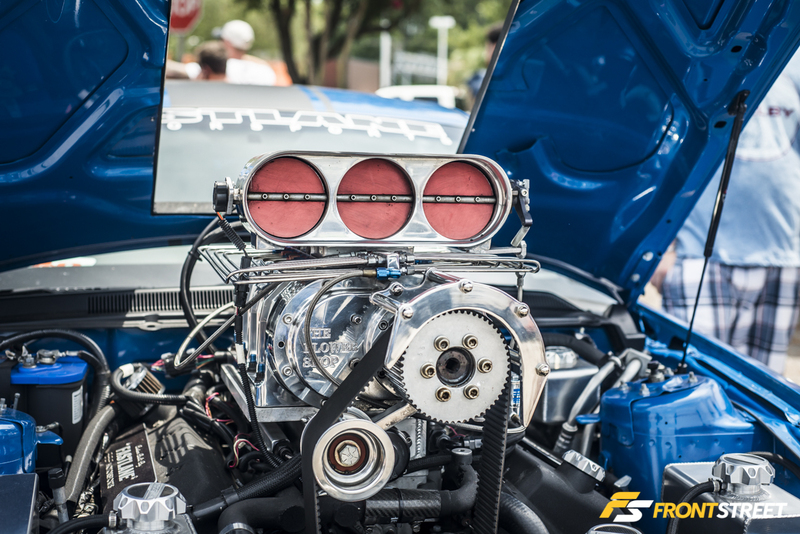 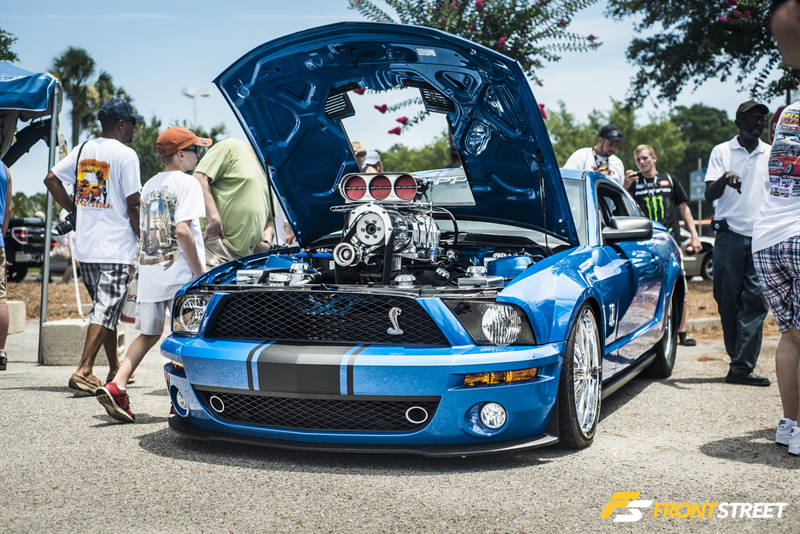 Fastlane Performance had a GT500 with a The Blower Shop supercharger so large it would make seeing the road troublesome. 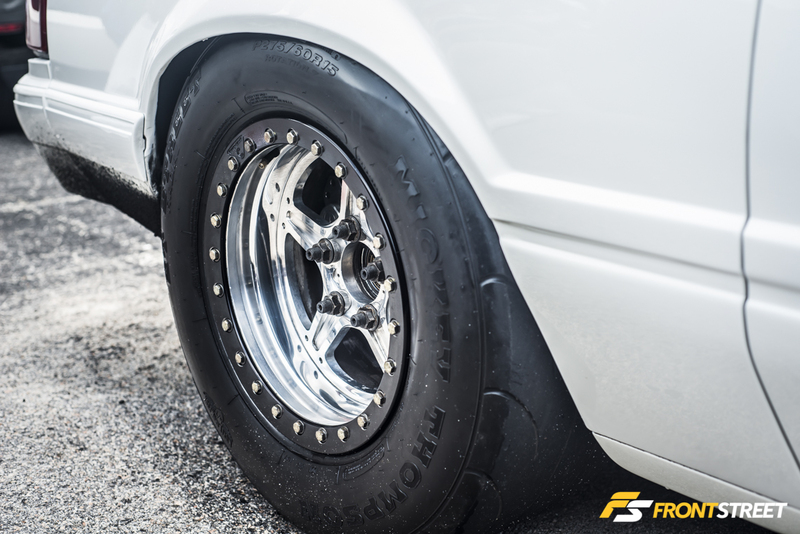 Whenever the front wheels are on the ground. 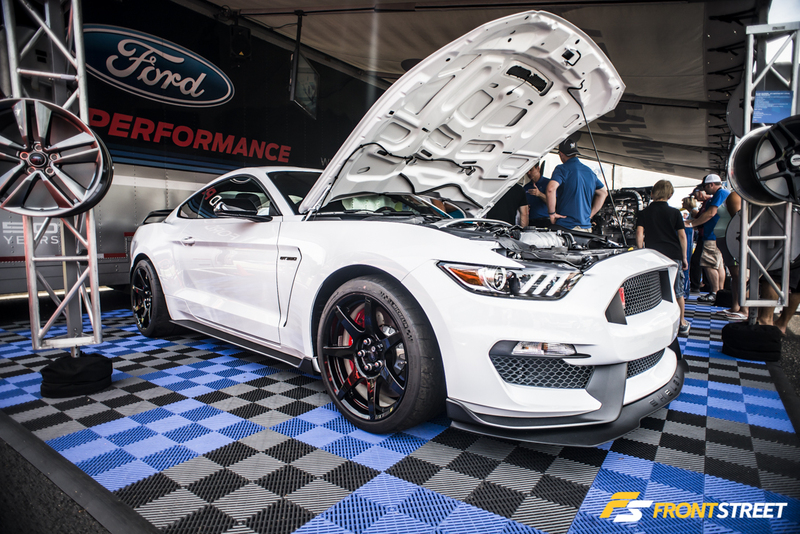 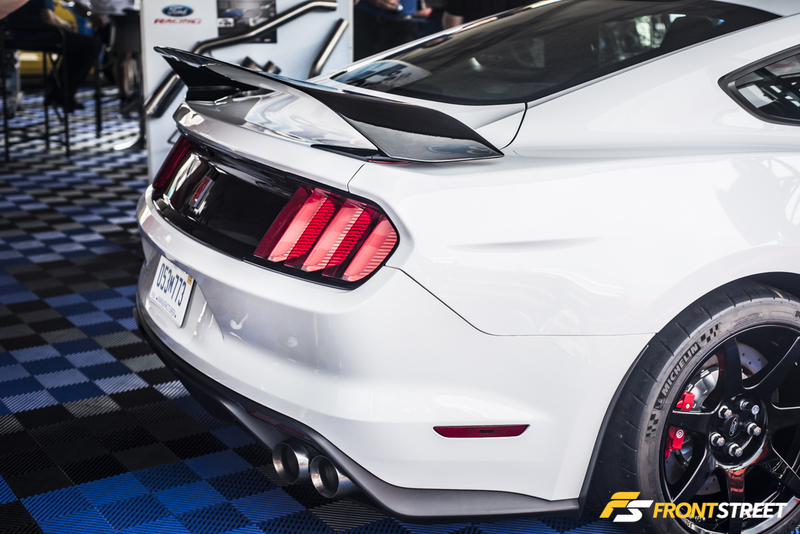 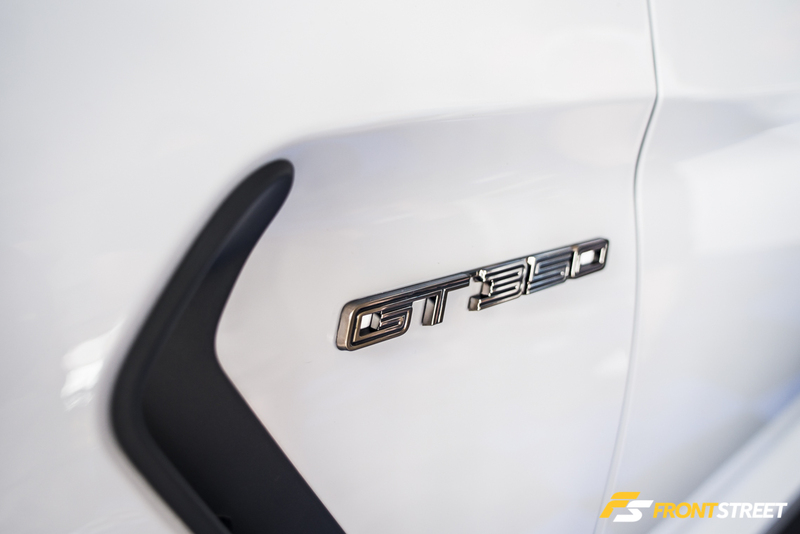 Ford Racing/Ford Performance’s commanding booth setup housed several sets of optional aftermarket wheels, engine setups and the new Shelby GT350. 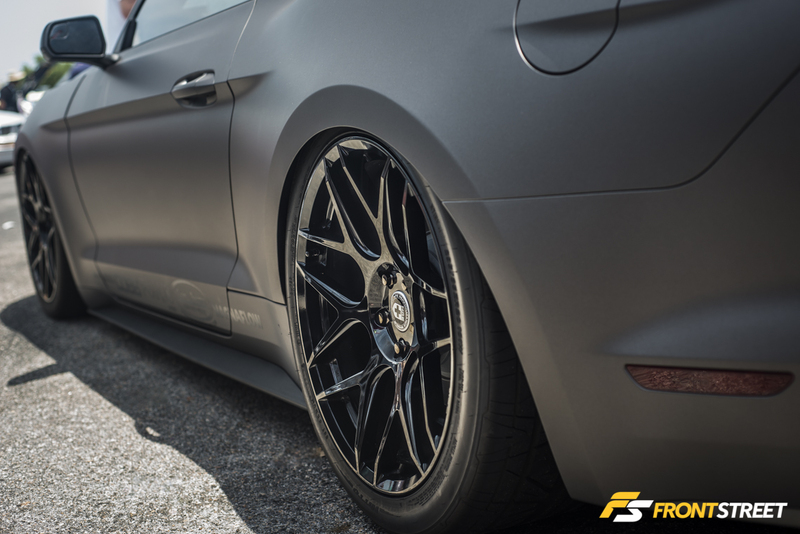 Among other additions, it hosts a more aggressive aero package to the stock S550 chassis. 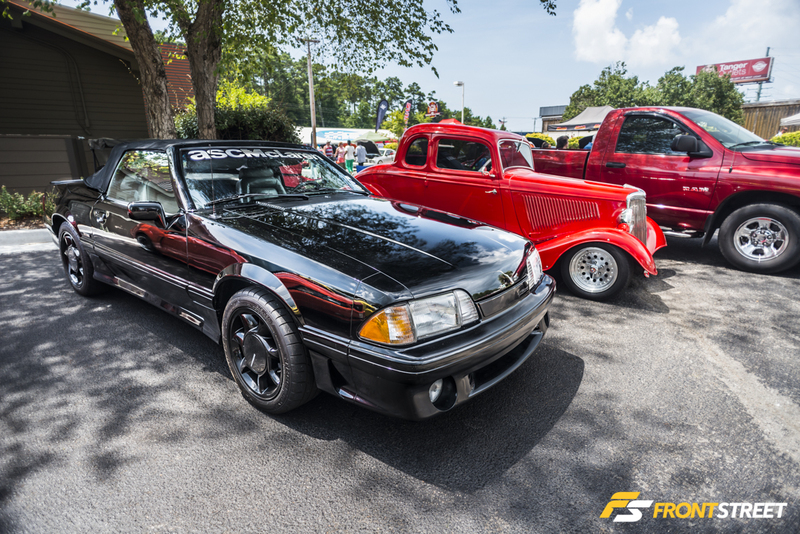 TMI Interiors brought a collection of different generations to show the upholstery capabilities with each model, including this notchback on True Forged wheels. 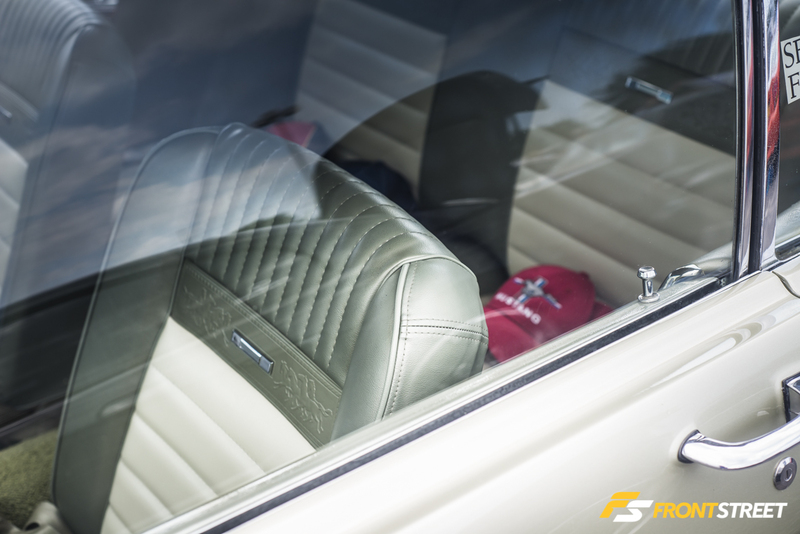 It had a stylish combination of materials and colors on the front and rear seats, which carried through every panel in the interior. 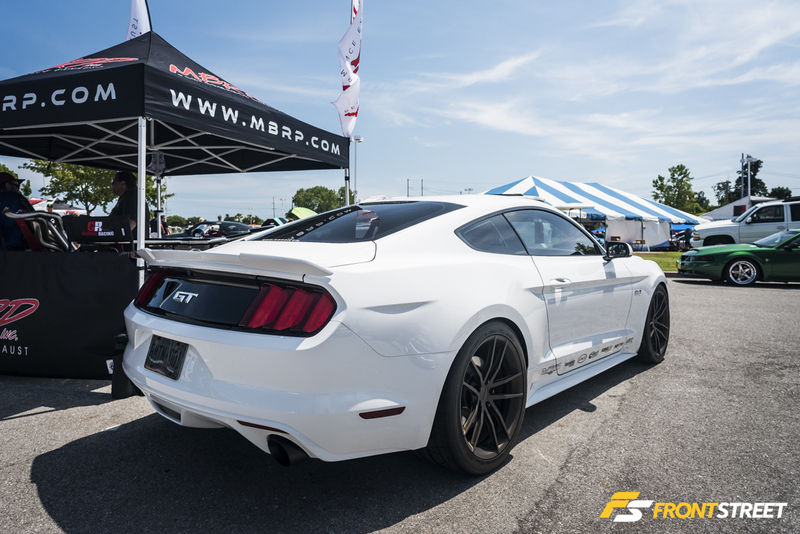 MBRP Exhaust brought a couple cars for their booth. 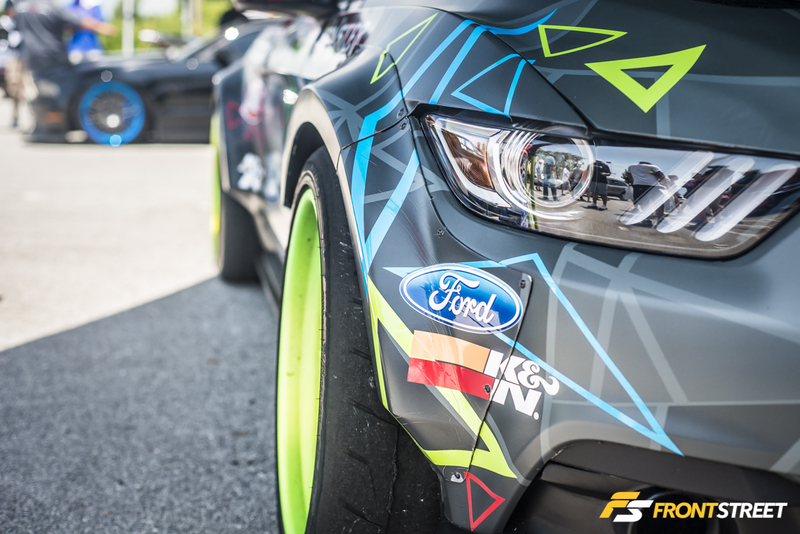 This one all the way from Canada for this event. 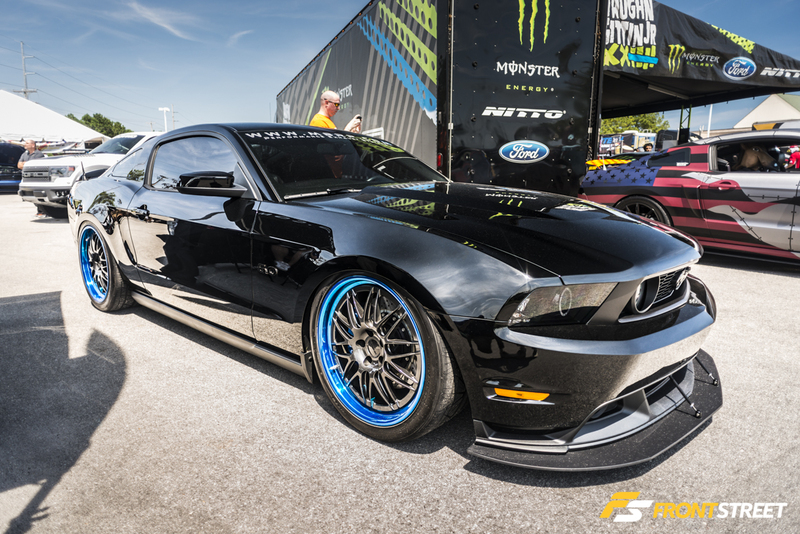 We’ll finish our Mustang Week coverage off with one of the few non-Mustangs of the event. 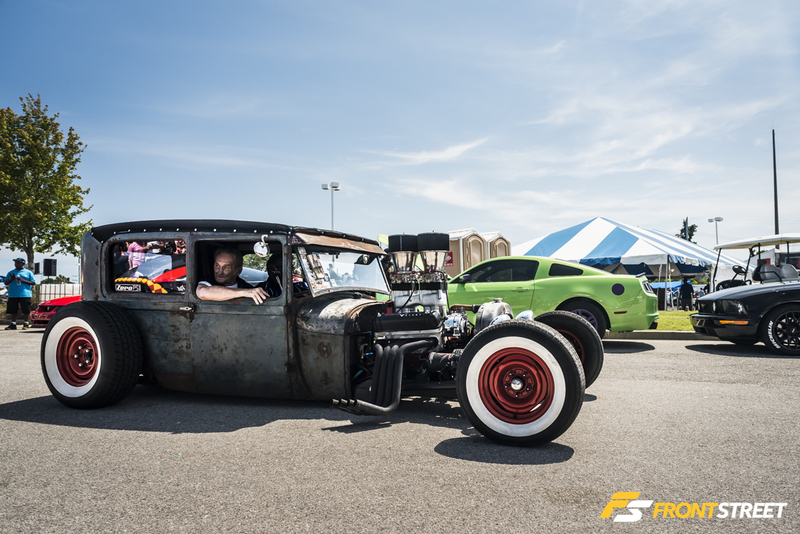 This 30’s rat rod took a trip through the parking lot and grabbed everyone’s attention in the process. 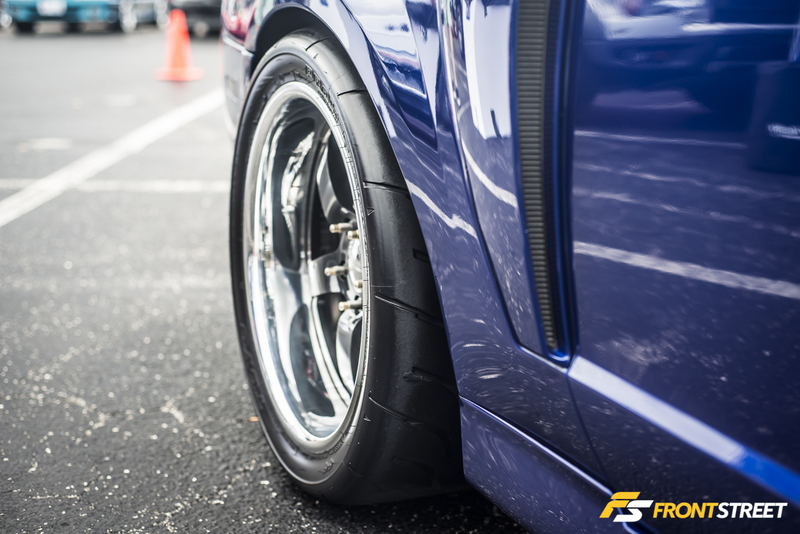 Notice the cut spare to accommodate the lowered stance.